Seen on Monday night at Loch Striven, the US Navy's Fleet Replenishment Oiler KANAWHA had arrived earlier in the day, having been involved in the multi-national Joint Warrior 091 exercise off the west coast. 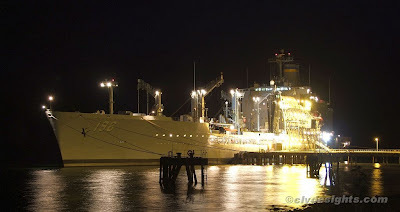 KANAWHA was launched by the Sun Shipbuilding and Dry Dock Co., at Chester, Pennsylvania, in September 1990, and joined the Military Sealift Command at the end of 1991. A twin-screw ship, she has a service speed of around 20 knots, and a crew of 81 civilains and 23 military personnel.